With some of the trampoline safety tips that we go over in this article, owning a trampoline can be both safe and fun for you and your kids. Having a trampoline is a great idea, and not just for your kids. It’s exercise for the both of you, helps your kids with coordination skills, and is a great way to keep active, in general. For one, what kid isn’t full of endless energy, and what kid wouldn’t want a trampoline in their backyard? As a parent, we look for safe, healthy outlets for our kids to sap their energy into and have a good time doing it. The main thing we talk to parents about when trampolines come into question, however, is the topic of trampoline safety. A lot of parents have seen videos online, and incidents in person themselves, of kids getting hurt on trampolines. Because of this, it’s important to speak to your family about the seriousness of having a trampoline, that it’s not okay to go completely wild on it, and that there are a few safety guidelines they’ll need to follow in order to keep it. The safest trampolines begin with trampoline tips and safety guidelines, which are exactly what we are going to discuss today. We’ll be going over the appropriate age for a trampoline, weight restrictions, important factors of buying a trampoline, features, and much more. 12.1 Which trampolines are the safest? 12.2 Are trampolines covered by homeowners insurance? 12.3 Are trampolines safe for exercise? 12.4 What age are trampolines safe for? 12.5 How many people should jump at the same time? 12.6 Which shape of trampoline is the safest? 12.7 Does the safety net go inside the springs or outside the springs? 12.8 Can you jump on a wet trampoline? 12.9 Are trampolines with nets safe? 12.10 What trampoline injuries are possible? 12.11 How often do trampoline injuries happen? While there is no definite “safe age” for kids on a trampoline, we recommend that no kid younger than 3 years of age step foot on a trampoline. However, as long as certain rules and guidelines are followed, you can introduce your child to a trampoline when they’re as young as 2. Where weight restrictions are concerned, you’ll have to look at the size of the trampoline itself. For example, there are trampolines that can only handle up to 150 pounds, but there are also trampolines with a weight restriction limit of up to 400 pounds. Weight restrictions are present for a very important reason, for both safety and durability. If you have a total of 200 pounds jumping on a trampoline that can only hold up to 150 pounds, not only is that a big red flag for safety concerns, but it’s also a major concern for the life of the trampoline. Abiding by the weight restriction will keep your trampoline alive and well for quite a long time. To asses the type and size of trampoline you’ll need, you’ll first need to go over the number of kids will be using the trampoline, what their ages are, and the size of your backyard, or wherever the trampoline is going to go. Right off the bat, adult supervision is the most important factor of having a new trampoline, so it must be mentioned before anything else. This is especially true if you have younger kids jumping on it. A lot of trampolines come with a safety net, making it the best choice to go with if you have kids that will be using it. Safety net enclosures are the best way to ensure your kids don’t go flying off the trampoline and hurt themselves. They can either be built-in or have you assemble and attach it once you purchase it. These net enclosures are the safest trampolines for kids, especially if more than one are going to be using it at the same time. They are also incredibly durable, are able to take a beating, and keep whoever may be jumping on the trampoline safe, in most cases. Always remember to look the durability of the net enclosure before you make a purchase, though. A durable safety net enclosure is made of heavy-duty materials, such as a dense polyethylene. They are made this way to ensure that they are tough enough to withstand a kid falling against it. If you are looking for a trampoline and find one with a net enclosure made of a heavy-duty material, you can be sure it won’t tear if someone falls into it. If you’re going to only have adults using the trampoline, however, a net enclosure may not be needed. Adults have better balance and control on trampolines, so one isn’t always necessary if only adults are going to be using it. The skirt of the trampoline prevents anyone, especially kids, from falling or getting underneath the trampoline while others are jumping on it. They also prevent any objects from being able to be stored under the trampoline to ensure that no one becomes injured while using it, which makes it a very important feature that most often overlook. 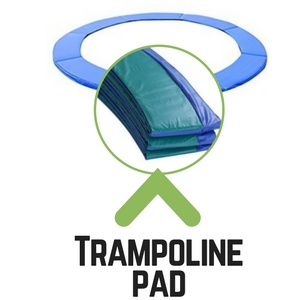 The pad of the trampoline works as a safety feature to cover the springs. The springs can be incredibly harmful, which is why the trampoline pad is so important to have. Someone could fall in the wrong area and have their fingers pinched in the springs, or a worse incident, so look for a trampoline that comes with a pad. If you’re unable to find one with a pad that works for you, you can also use a DIY spring cover solution. For example, you can use some cut up pool noodles to go on top of the springs for added safety. Unfortunately, this is not always guaranteed to keep the springs covered and those using the trampoline safe. There is a chance they could pop off, essentially because they are made for the pool and not for this purpose, but it’s better than nothing. Overall, you should look for a trampoline with a safety pad instead of using a DIY trick to cover the springs. Have you ever seen a trampoline without springs before? Most people haven’t, but they’re the safest trampolines money can buy. More specifically, Springfree Trampoline is a company who offers exactly what they’re called – trampolines without springs! Their prices start at $1200 and up, offering a wide range of sizes. Their smallest trampoline is around 8 feet, with the largest trampoline reaching 13×13 feet. They have a size and a cost for all needs and spaces. Each one comes without springs and a safety net enclosure for maximum safety. Instead of the metal coil springs that are commonly used in trampolines, Springfree Trampoline uses flexible, composite rods that go underneath the trampoline and completely out of the way of fingers and limbs. Their trampolines also have a hidden frame that is located underneath the trampoline, as well. It’s impossible to bump it or hit it while jumping on the trampoline. 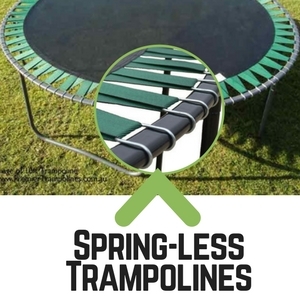 Other trampolines, however, have a metal frame located on the jumping surface area, which is Springfree’s are much safer than other trampolines. SoftEdge mats are included in the enclosure that make it a shock-absorbent jumping surface and their FlexiNet net robs that prevent falls and make jumping into the net enclosure a lot more comfortable, too. The first step to having a safe trampoline is setting it up correctly. Always read the instructions, look at any pictures thoroughly, and ensure that you have assembled it the correct way. Always remember that before anyone gets up onto or jumps on the newly assembled trampoline, make sure that you check it for defects. You should also double check the assembly instructions another time to ensure that you did everything correctly once more. This is where adult supervision comes into play, especially when you have a new trampoline that’s exciting for kids. No doubt they’ll all want to climb on and give it a go straight away, but make sure you explain the rules and some additional safety guidelines before you let them on, which includes adult supervision. In most cases, especially if you have a relatively small trampoline, creating a “one at a time” rule may be the best case scenario here. You will also want to explain that jumping in the middle of the trampoline, not around the edges, is extremely important. This also makes it better for kids to learn balance and control while jumping on a trampoline, keeps them away from the edge, and also keeps them from being trampled if they fall on the trampoline while someone else is jumping. You must also stress the fact that they cannot be horsing around near the edges of the trampoline. The edges are the area where the most injuries occur, whether it’s getting a pinched finger in the springs or falling off the trampoline entirely. This brings us to our next point – no somersaults. Explain that only feet should be on the trampoline, not heads and certainly not necks, especially if there is more than one person using it. The attire you and your kids wear on the trampoline is just as important as assembling it itself. For one, always make sure you are not wearing any jewelry before you get on. This includes earrings, necklaces, bracelets, rings, any type of jewelry whatsoever. You will also need to explain that their pockets must be empty before they can go up and jump around. It’s in your best interest to check their pockets and double check that they have nothing in their pockets. Light clothing is always best when jumping on a trampoline while either jumping barefoot or in special trampoline socks. If your kids, or you yourself, are going to be wearing socks on your trampoline, make sure they are non-skid and/or slip socks to ensure no falls happen as a result. 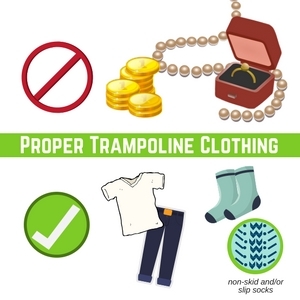 A big part of our trampoline safety tips has to do with the clothing you wear while on a trampoline. You can have all the safety nets and padding in the world, but if you are wearing clothing and jewelry that isn’t safe for the trampoline, you’re canceling all of that out the second you get up there and start jumping. If the trampoline you purchased has a ladder included with it, make sure you use it and let your kids know that they are not to jump off the trampoline to the ground – they are to use the ladder in a safe fashion. Using the equipment that comes with the trampoline correctly is just as important as using the actual trampoline correctly. No doubt your kids will be having a ton of fun and will want to jump straight off the trampoline and to the ground when it’s time to get off, but you need to remind them that doing so is dangerous. Let them know that any extra equipment, such as a ladder, for example, isn’t included for no reason. It’s included to ensure that you have both a safe and fun experience with the trampoline, and that using the ladder to get on and off of it is extremely important. What kind of trampoline safety guide would this be if we didn’t include a section for the adults? We’d like to switch gears here for a minute and go over some trampoline education tips that are strictly for the adults who plan on using the trampoline, as well. For starters, do not use it while under the influence of alcohol or medications. If your medication warns that you should not be using heavy machinery, or that you will be dizzy and drowsy when taking it, don’t even think about getting on that trampoline. Using a trampoline while under the influence of alcohol may sound like a ton of fun, but, believe us, it’s incredibly dangerous to do. Your balance is affected in a negative way when intoxicated, which is important when using a trampoline. You can easily fall and hurt yourself when your balance isn’t exactly in a good state while on a trampoline, so make sure you’re completely sober when jumping on one. Like your kids, you will need to adhere to the weight restrictions of the trampoline, as well. This is especially important if you and another adult are jumping on it at the same time. If the trampoline starts moving or groaning under the weight, there is currently too much weight on it. Even if you assembled the trampoline the correct way the first time, it’s crucial that you do a short inspection before every jump session to ensure that all is still well and it’s safe to get on. Start by checking to see if it’s dry. Even if it hasn’t rained lately, there’s still the issue of condensation. Rain and condensation make for a slippery, unpleasant trampoline, so always make sure that it’s completely dry before you or your kids use it. It’s also important to mention that the weather elements have a hand in breaking down trampolines over time. Because of this, we highly recommend that you use a trampoline mat during the winter to protect it from snow wearing it down. Next, make sure that there is nothing underneath the trampoline. If your kids have a ton of toys out in the yard where the trampoline is more often than not, make sure that you clear any toys that may be underneath it before you or your kids get on to have a jump session. This may be a given, but make sure that no one is underneath the trampoline, as well. 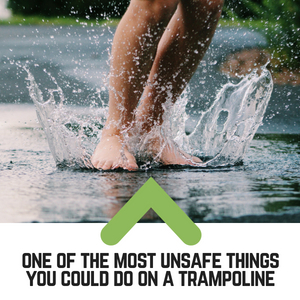 Jumping on a wet trampoline may seem like a good idea for a bit of fun, but it’s something that should definitely be avoided. It’s one of the most unsafe things you could do on a trampoline. A wet trampoline can affect your balance, causing you to fall off completely if you don’t have a safety net or any type of enclosure system. They become slippery, a dangerous hazard, and something that should be left to dry completely before being used again. If you’re not keen on the idea of waiting for your trampoline to dry before your next jump session, there are a couple of things you can try to speed up the overall drying time. For example, use a towel to wipe around the safety pad and the ladder, if you have one. Using a new, dry towel, pat the mat down repeatedly until either the trampoline dries out, or until it’s at least somewhat dry. If this is not an option, however, you will more than likely have to wait until the sun naturally dries out the trampoline. This is the best option to wait for, obviously. Though you may not want to think about it, trampoline injuries do happen and they’re a lot more common than you may realize. What’s more, trampoline injuries statistics can be a little scary. In fact, on average, there are approximately 100,000 trampoline-related injuries each year. From 2002 to 2011, over 1 million people were admitted to the emergency room because of an injury caused by a trampoline. Fortunately, if you set specific trampoline safety rules for yourself and whoever else is using your trampoline, you won’t have to worry about the above list of common injuries. In fact, they’re actually not that common. Thankfully, these days, more people are making smart choices when using trampolines, all the while ensuring that anyone using their trampoline follows them, as well. Because of this, trampoline injuries statistics are lower than ever before, so don’t be afraid to invest in a trampoline. 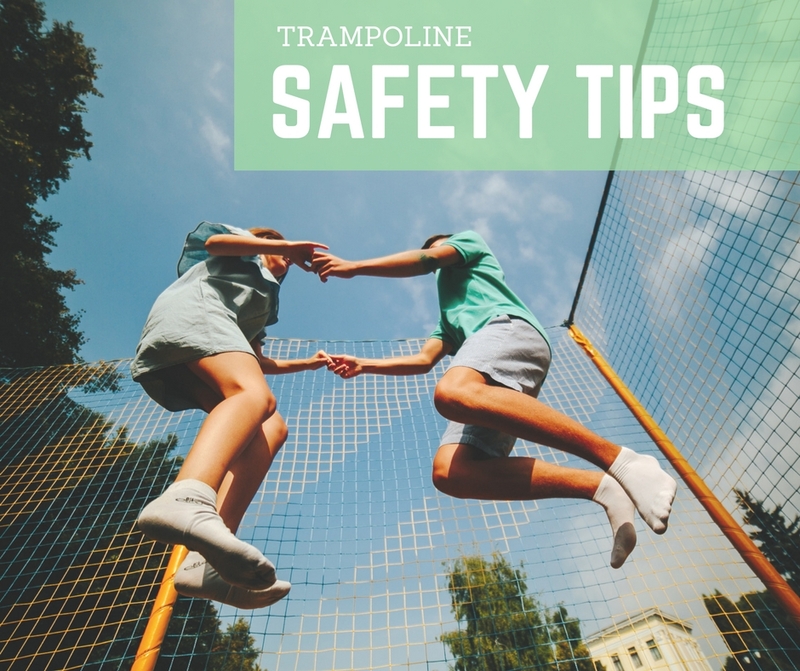 As long as you respect your trampoline, follow safety rules, and always be aware of what you’re doing while using it, you won’t have to worry about injuring yourself. Where kids on a trampoline are concerned, adult supervision and safety education are key and must be done before any of them go up for a jumping session. You and your kids must feel completely comfortable and that the trampoline is entirely stable before going up, as well. If your kids are uncomfortable with the large size of the trampoline, there are always smaller ones that will suit them better, too. In conclusion, having a trampoline in your backyard for yourself and your family brings more benefits that take seeing and enjoying to believe. They are great for exercise, a fun afternoon, and help your kids learn to coordinate themselves better at an early age. Download this fun Trampoline Safety Tips Poster from the Consumer Product Safety Commission. Want to learn more about trampolines? Check out our ultimate guide to trampoline history! 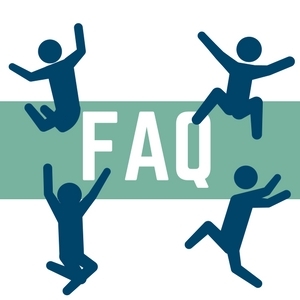 If you don’t see your question listed below in our FAQ section, get in touch with us and we’ll do our best to give you a straight, thorough answer! Which trampolines are the safest? The safest trampolines are no doubt the trampolines from Springfree Trampoline. Instead of using traditional springs in their trampolines, they use flexible, composite rods that you don’t even see when you’re doing a jump session! They also use a hidden frame that’s impossible to hit yourself on while jumping, SoftEdge mat technology, and the FlexiNet enclosure that prevents falls and cushions jumpers. Are trampolines covered by homeowners insurance? Insurance companies are not fans of trampolines whatsoever, especially because the number of accidents on trampolines are on the rise. This is why we’ve made this trampoline safety tips guideline – to give you the information you need to avoid accidents and injuries. Unfortunately, your homeowners insurance can actually go up per month if you have one, but to know for sure you will need to speak to an insurance agent from your homeowners insurance provider. They will be able to give you all of the answers you’re seeking. Are trampolines safe for exercise? Trampolines are an excellent exercise method, absolutely! They are great for your legs and will have you jumping up a sweat in no time. In fact, there are mini trampolines you can have inside your home to do in-home trampoline exercises. According to the website The Fit Day, a woman of around 120 pounds is able to burn up to 143 calories every hour while on a trampoline, compared to the 151 calories that are burned per hour when walking. It’s safe to say that an hour or so of jumping on a trampoline each day is a great exercise method. It’s a type of cardio workout that isn’t too stressful on the body, and is a great way to both exercise and release some energy. What age are trampolines safe for? There is no general “safe” age for trampolines, but it’s recommended that kids are okay to jump on one by the age of 3. This is, of course, if the parents have done their part to ensure the child’s safety while they jump on it. How many people should jump at the same time? To be completely honest, only 2 people maximum should be jumping on a trampoline at one time. If there are kids up on the trampoline, they should be briefed on trampoline safety tips beforehand and always have adult supervision while on it. For adults, however, always remember not to be reckless on the trampoline, especially when there is a second person with you on it. Which shape of trampoline is the safest? The safest trampoline, in general, is one that has a safety net enclosure. The size and shape of the trampoline doesn’t matter where safety is concerned, what does matter, however, is how it’s used and the safety features it has. Does the safety net go inside the springs or outside the springs? Where the safety net goes on a trampoline depends on the actual trampoline itself. Some have them on the inside of the trampoline, while others have it on the outside of the springs. This is why it’s extremely important to always read the instructions carefully and assemble the trampoline properly as per the instructions and any photos shown in them. Can you jump on a wet trampoline? Jumping on a wet trampoline is seriously asking for trouble. For one thing, the safety pad will no doubt be wet, as well, which completely cancels it out. The actual jumping surface will also be just as slippery. In short, jumping on a wet trampoline is a very dangerous thing to do, and should be avoided at all costs. Are trampolines with nets safe? 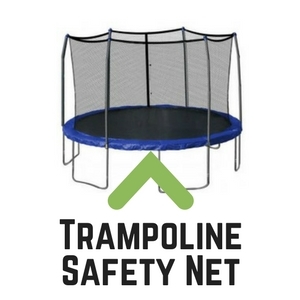 Trampolines that use nets are, in fact, much safer than trampolines than don’t have them. Trampoline nets ensure that everyone currently using the trampoline stays inside the perimeter and won’t have a chance of falling off. The only real way a trampoline with a net isn’t safe, is when, if applicable, you don’t properly secure the “door” of the trampoline net once you’re inside and on the trampoline. 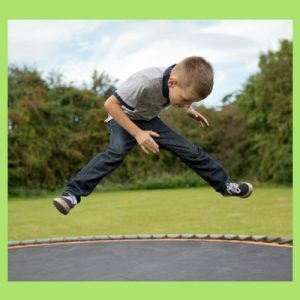 What trampoline injuries are possible? In full honestly, a lot of injuries are possible when it comes to trampolines. Unfortunately, if you’re not careful, even death can occur if a trampoline is not respected, safety rules are broken, and you’re not careful, in general. Anything from bruises, cuts, scrapes, sprains, strains, concussions, broken bones, and serious head injuries can occur from the misuse of a trampoline. Because of the possible injury outcome, it’s extremely important to make and follow safety rules for your friends, family, and even just for yourself. How often do trampoline injuries happen? Based on trampoline injuries statistics, trampolines are responsible for up an average of 100,000 injuries each year. Keep in mind, however, that trampoline injuries most often occur when safety rules aren’t followed.